As I've noted before, the editor of the excellent Canterbury regional lifestyle magazine Latitude, Joanne Taylor, has been kind enough to let me republish any crime fiction reviews published in Latitude, here on Crime Watch. It's an excellent magazine - it comes out quarterly and is about 160-180 pages each issue - so keep an eye out for it if you're in the area. I've written some large features, travel articles, and book reviews for them over the past year. The current (Spring) issue, which came out the week prior to the Canterbury earthquake, included several crime fiction reviews - including reviews of the latest books from each of the three Ngaio Marsh Award finalists; Vanda Symon, Alix Bosco, and Neil Cross. As I've already published a longer review of Neil Cross's CAPTURED here on Crime Watch, I won't republish the Latitude review here. However, here are the other two Kiwi crime fiction reviews from the latest Latitude. Enjoy. I eagerly awaited the second novel from Auckland writer Alix Bosco. 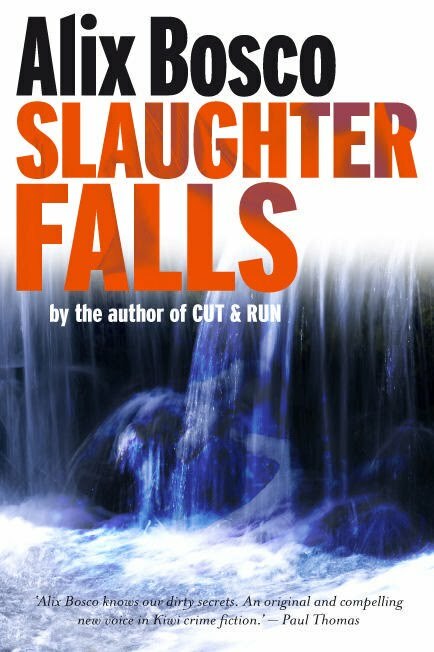 SLAUGHTER FALLS continues the ability of the prime character, Anna Markunas, to end up in bizarre crime scenes. Eager to put her research skills to use in Queensland while there on holiday, Markunas attempts to track down the family of a fellow tour party member who died suddenly. As she gets closer to the truth, the dark world of Australia's corrupt underbelly looms - who is helping and who is hindering the investigation continues to keep the reader turning the pages. The character of Anna Markunas develops nicely in this sequel (to the first novel CUT & RUN) with the stories of her children interwoven throughout with the impending arrival of a grandchild and the worry that her sone will slip back into bad habits. A great book to curl up with. Dunedin crime writer Vanda Symon brings back her feisty local heroine Sam Shephard for a third instalment in what has become an excellent detective series. In CONTAINMENT, the junior detective investigates a bizarre death - what seems a routine diving accident before forensics reveal the man didn't die from drowning and his body was stuffed in the wetsuit afterwards - that might be linked to the grounding of a container ship on the Aramoana coast. CONTAINMENT once again shows Symon's talent for well-rounded characters, unique set-pieces, and Dunedin touches that give readers a strong sense of the student-packed southern city, while fleshing out even more about Shephard's personal life. Enjoyable, and well worth reading. What do you think of the reviews (we are very constrained for space)? Are you planning on reading either book? If you already have, what to do you think of it/them? Thoughts and comments most welcome.